Baby was in heavy labour when she was dumped in the drop-box of the local pound one night. She gave birth to seven puppies on the cold hard concrete floor of her cell. In the morning, ARK came to the rescue, taking Baby and her pups to the home of one our dedicated volunteers for critical care. Baby gave birth to another two pups that day, making a total of nine. Against the odds, eight pups survived. Baby was very emaciated, no more than skin and bones. 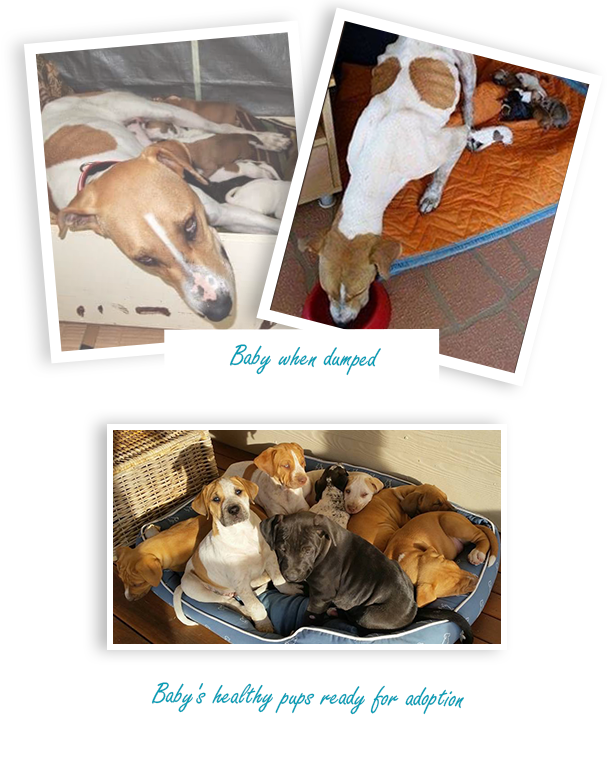 Her carer fed her four or five times a day so that Baby, in turn, could feed her pups. Once their condition stabilised, Baby and her little family moved into the home of another devoted foster carer. The pups grew beautifully, and Baby thrived.